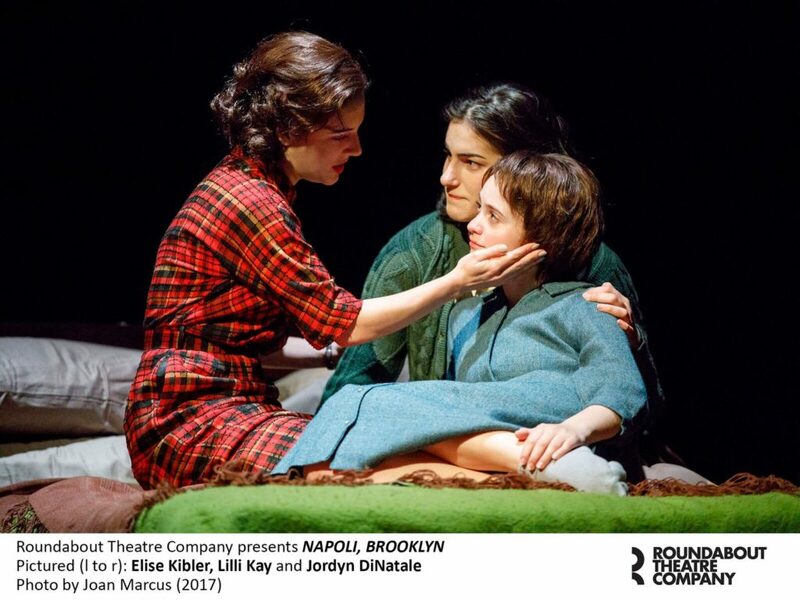 As an Italian-American from New York, a play with the title, Napoli, Brooklyn, is certainly a theatrical piece I would be interested to see. 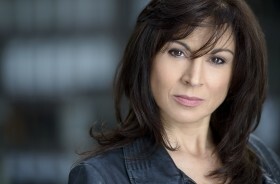 Written by Meghan Kennedy, set in 1960 Brooklyn, the play centers around the Muscolino family, including two immigrant parents and their three daughters, Tina, Vita and Francesca. The mother, Ludovica (Alyssa Bresnahan) is strong and kind and an incredible cook, but has a fixation with an onion, which is a recurring prop item throughout the play. Luda actually speaks to the onion as the play begins. She is hoping it will help her to cry. Obviously, Mrs. Muscolino is harboring stunted emotions, and her strength is eclipsing her ability to feel. There is good reason for that. Her husband, Nic Muscolino (Michael Rispoli), terrorizes the family, and in fact, put his middle daughter, Vita (Elise Kibler) in the hospital with a broken nose and ribs, when she protected her younger sister, Francesca (Jordyn DiNatale) from their father. Following the altercation, Vita was packed away in a convent to learn discipline from the nuns, but Vita’s fiery and comical temperament is not held down. And that is just one plot interwoven into Napoli, Brooklyn. There is way more. A teen love affair between Francesca and her best girlfriend, Connie Duffy (Juliet Brett) is explored, as they plan to stow away on a ship to Paris, where they can smoke cigarettes and be who they really are. There is the down trodden oldest sister, Tina (Lilli Kay) who harbors guilt because she did not protect her sisters during the fight with their father, and dutifully works in a menial factory job to be the good girl in the family. Flirtations between the local butcher, Albert Duffy (Erik Lochtefeld), who is Connie’s father, by the way,and Mrs. Muscolino are peppered throughout the play. An inter-racial friendship takes hold in the factory where Tina is employed, as she works side by side with Celia Jones (Shirine Babb), an African-American woman from the neighborhood. There is a lot of information packed into the two hour play, and that doesn’t even address the real life horrific incident that takes place right before intermission. It is a stunning event, to say the least. According to interviews I have read with the playwright, Meghan Kennedy, her Italian- American mother experienced this event and prompted Ms. Kennedy to write the play. Kudos to set designer Eugene Lee, sound designer Fitz Patton, and lighting designer Ben Stanton for depicting the event and creating the atmosphere so authentically. Needless to say, that stunning incident sets the scene for change in the family in Act Two. Nic Muscolino amends his ways, and becomes the charmer and romantic that his wife remembers. Vita comes home for the holidays, but does not believe that the change will stick. And, of course, it doesn’t. A lot of ground is covered in Napoli, Brooklyn. Perhaps too much. For me, I was missing an emotional connection to the story, which was disappointing. It may be that there was just too much blended into the mix. However, the acting, especially by the women playing the three sisters, is excellent. Their characters are well formed and they are the most interesting to watch on stage. I would like to see the three characters emerge in a new play set thirty or more years later, without their parents in the picture, to see who they have become. In this play, the three sisters are mainly concerned with the desire to flee from their suffocating surroundings.